Create stunning stained glass windows to display in your home or to give as gifts. 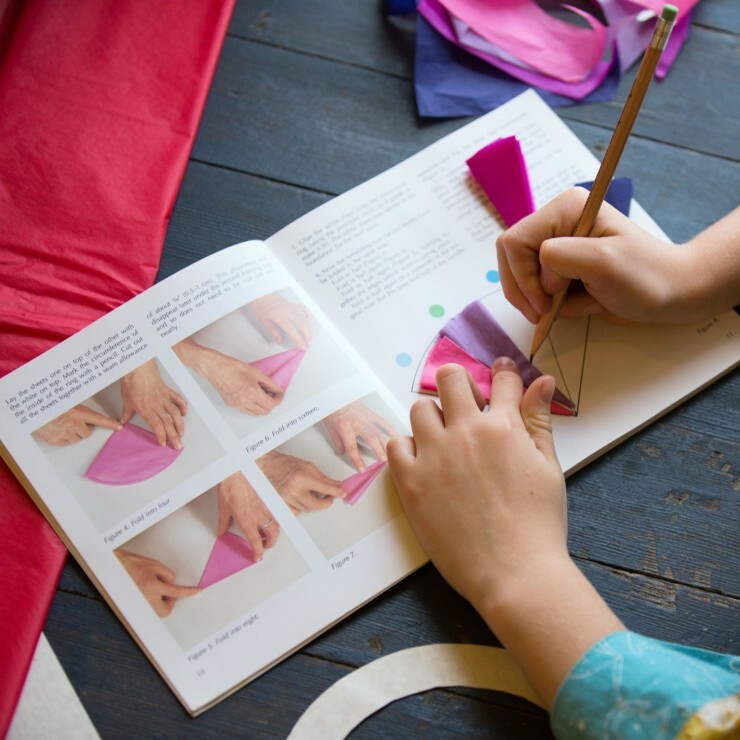 This is a craft that adults and kids aged six and up will love to do year after year. 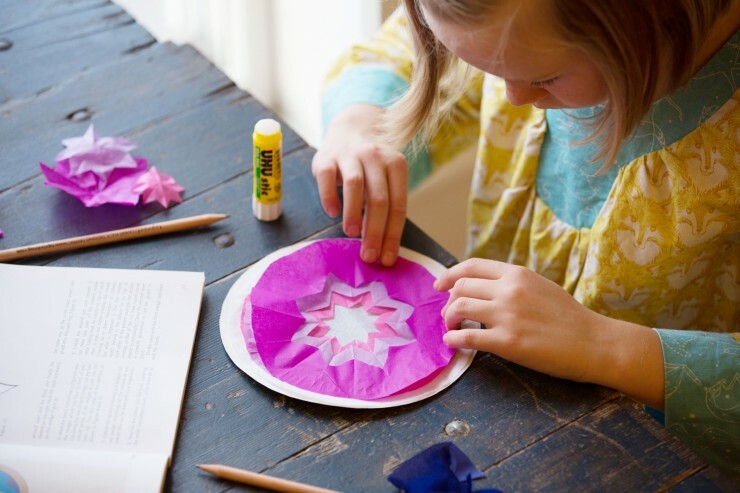 You’ll need the Rose Windows Book and Art Tissue Paper for this project. As the book progresses from simple flowers and stars to intricate gothic rosettes, the designs become more complicated, and the results even more beautiful. 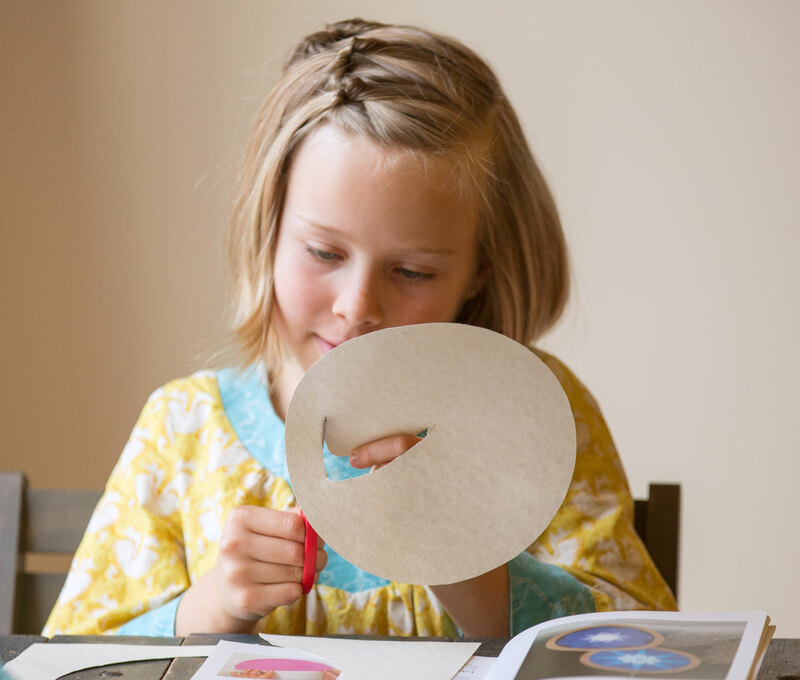 Make two ring frames: Using a compass, trace a 7-inch diameter circle onto the cardstock. 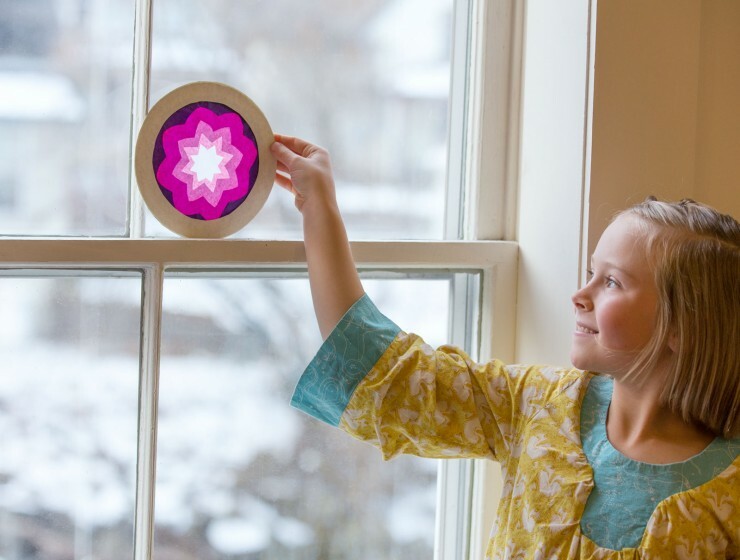 Keeping the point of the compass in the same center spot, trace a 5.75-inch diameter circle within the larger circle. Cut along the lines to make the first frame. To make the second one, you can either repeat the process or simply trace the first frame. 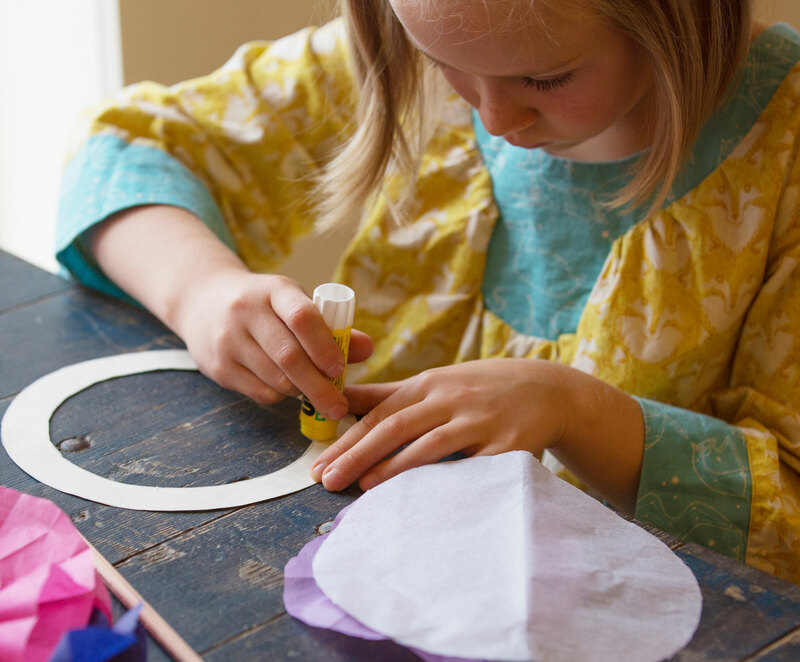 Select tissue paper and cut circles: Choose four different colors of tissue paper for your flower, plus a piece of white for the center. To start, you might want to select different shades of the same hue—the progression from light to dark, accentuated by the layering of the tissue, is a surefire way to create a stunning flower. 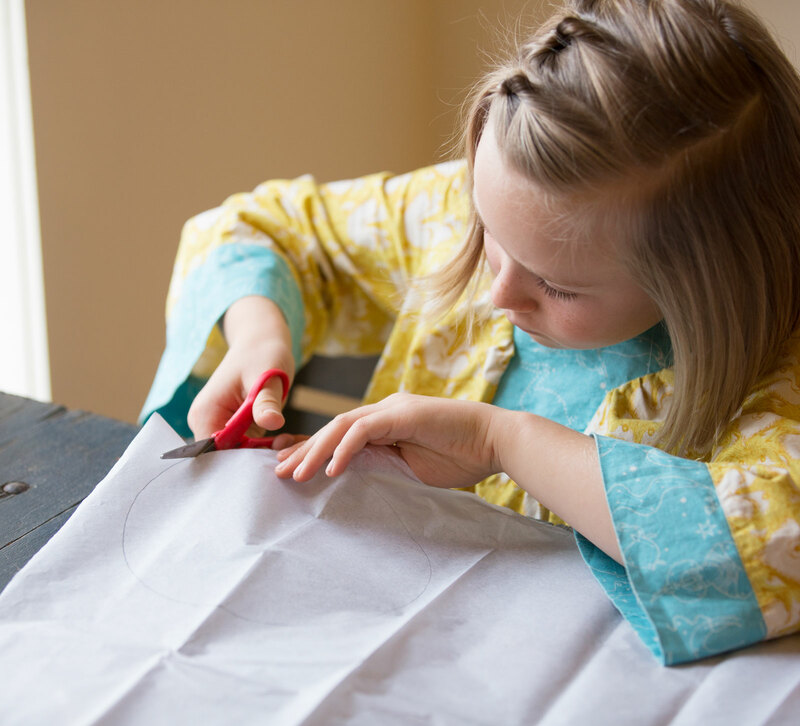 Place your ring frame on each piece of tissue paper and trace around the outside. 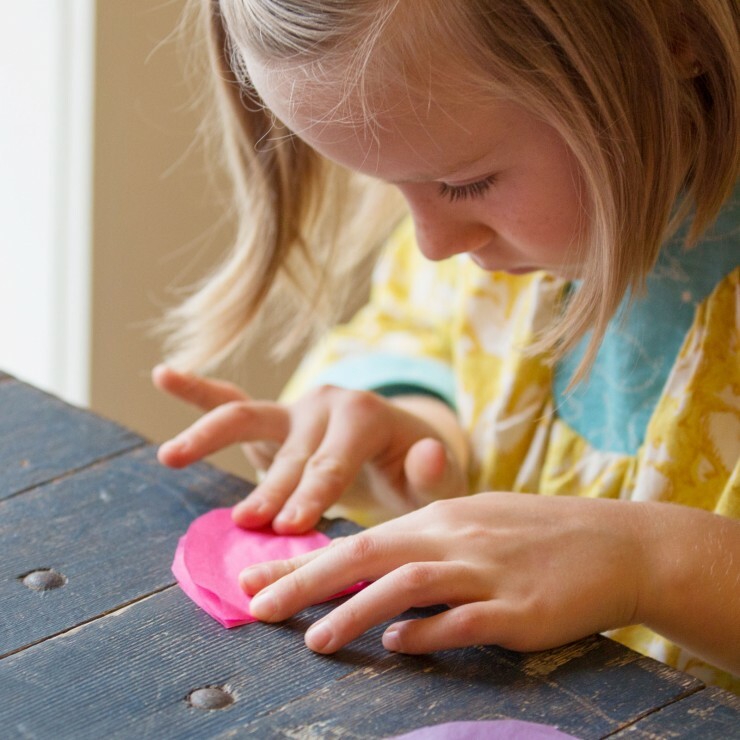 Cut the colored circles out, adding about a quarter-inch extra all around so you have room for gluing later. 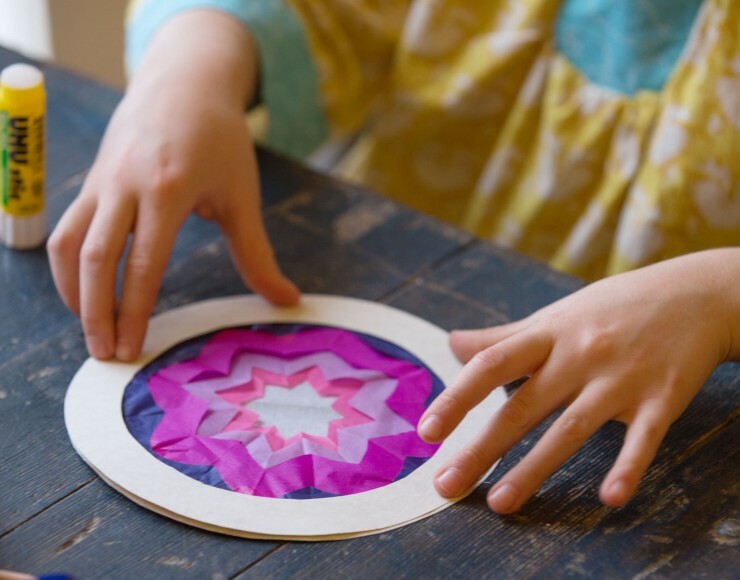 You can also layer all five pieces on top of each other, trace around the ring, and cut them out at the same time—just be careful not to let the paper move while cutting. Fold the colorful circles: Set aside the white circle. Fold each colorful circle in half, then in half again. Fold in half again, and for the final fold, the top half of the bundle goes to one side, while the other half goes the opposite way. (See page 10 of the book for a helpful illustration of this). Be as precise as you possibly can with the folds. The more precise you are no, the more symmetrical your finished design will be. 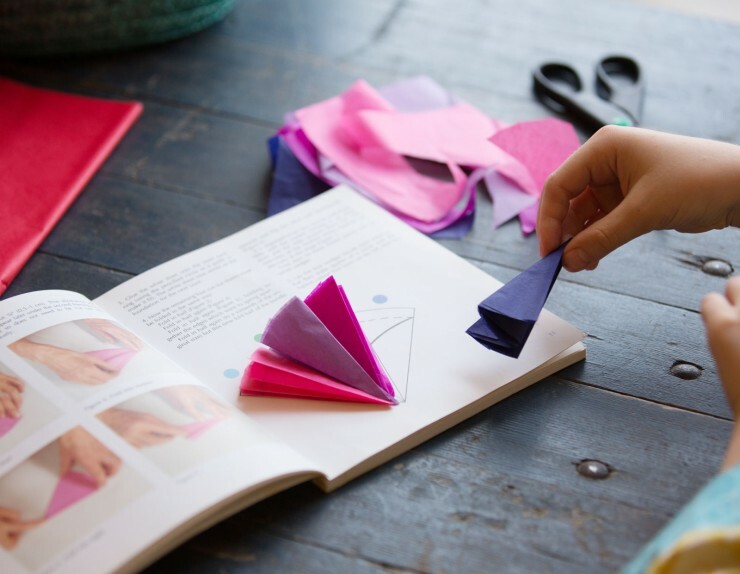 You will now have four colorful wedge-shaped pieces of folded paper. Transfer design to wedges: Place the wedges side by side on the template on page 13, with the lightest color on the left, progressing to the darkest color on the right. 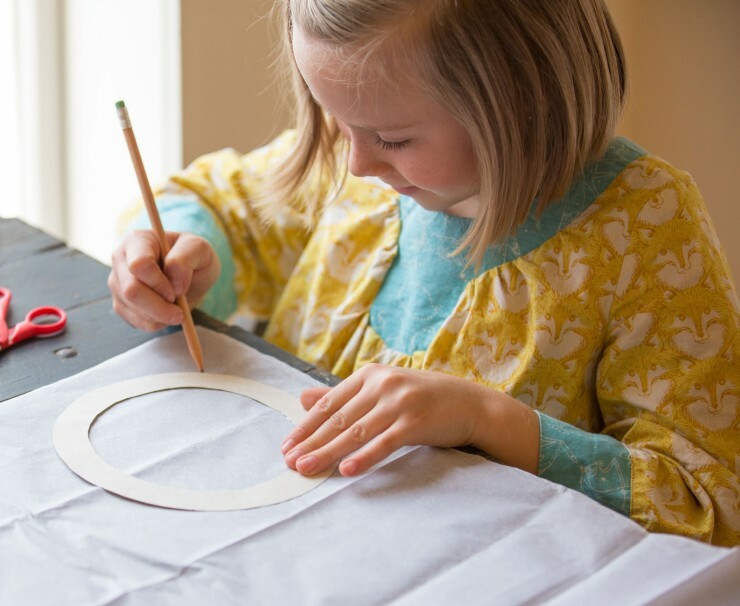 Draw the curved black line from the template onto the wedges of tissue paper. You won’t be able to trace, but if you mark the beginning and end point on the paper you can draw a curve freehand. Try as best you can to duplicate the line of the template. Create a continuous line that carries across all four wedges. 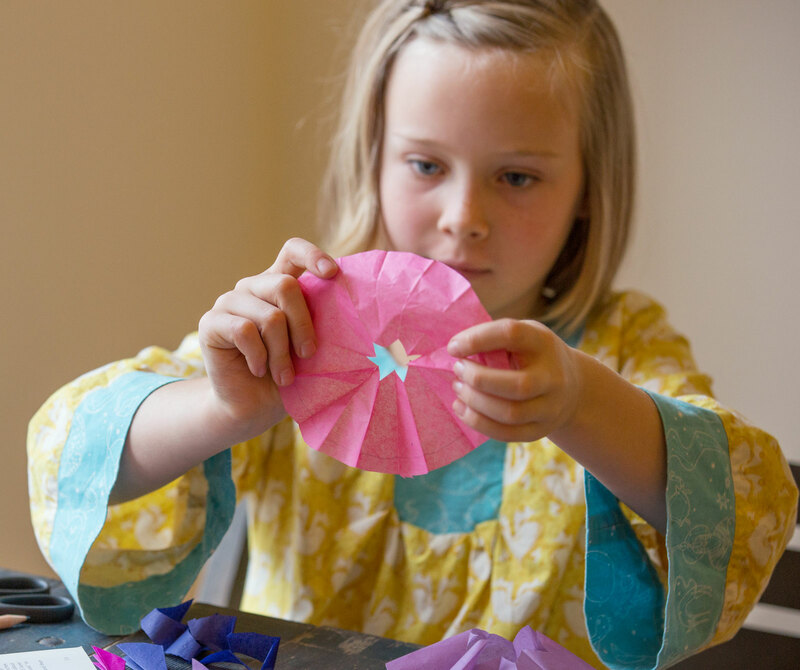 Cut out flower pieces: Cut along the lines, then open up each “flower” and smooth out the creases. You’ll be using the outer portion, but keep the small inner flowers—stacked on top of each other, they make a lovely little flower which could be used to decorate a gift. 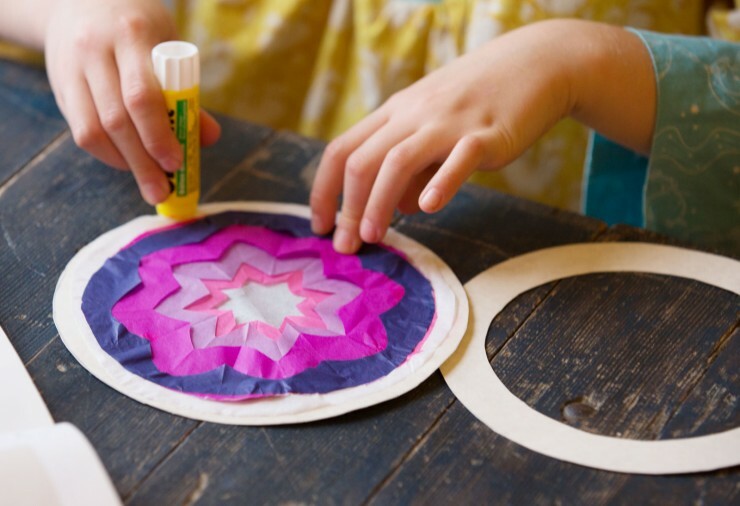 Glue tissue pieces to frame: Start with the circle of white tissue you set aside earlier. Centering it as best you can, glue it onto one piece of the frame. A good method is to trace along the edge of the frame with a glue stick, then press the top, bottom, left and right parts of the tissue down at the center points. It’s okay if the tissue paper extends beyond the frame, you’ll trim it off later. Next, glue down the piece of tissue which was the first wedge on the left (it’ll have the smallest opening) in the same fashion. Continue with the next piece, and so on. 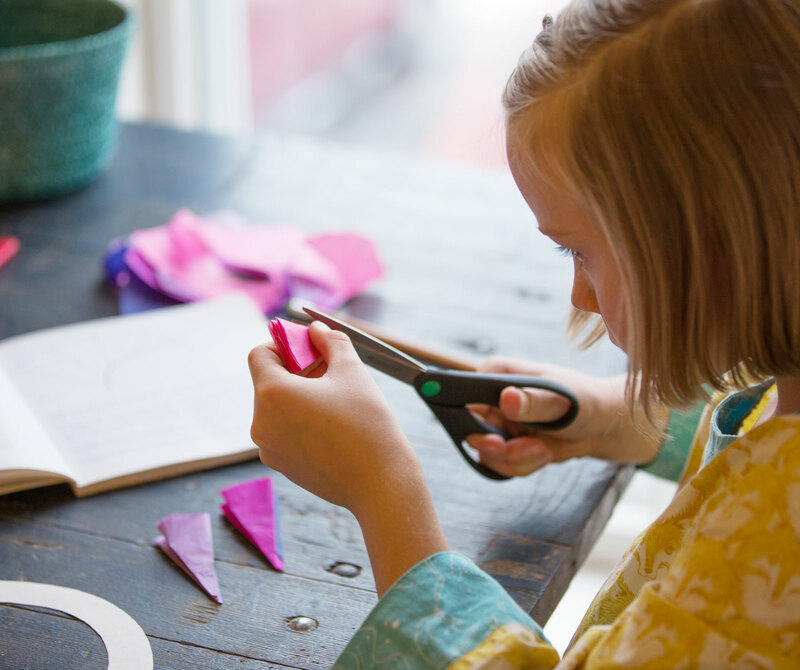 Each flower will frame the opening of the flower underneath, guiding you as you glue it down. Do your best to center each piece. Glue on the top frame: Apply glue once more to the edge of the frame and place the second ring frame on top of the rose window, sandwiching the tissue paper between. Trim off any paper that may be sticking out from the edges of the frame. 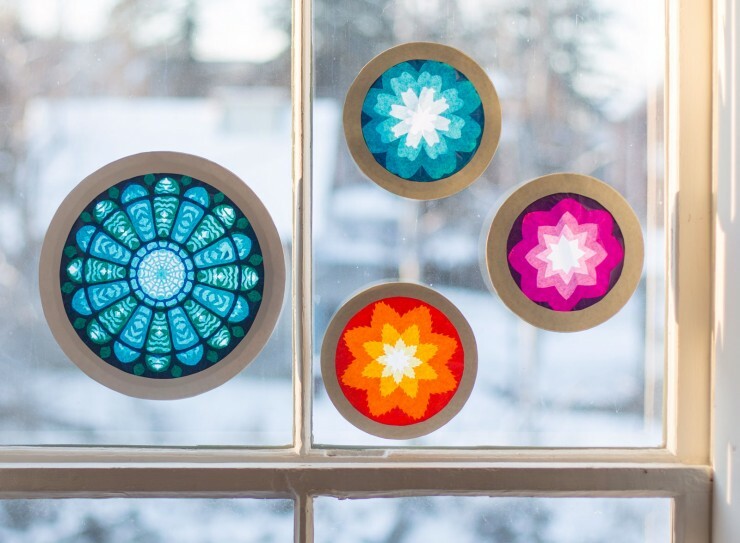 Your rose window is complete! Hang it in a window and enjoy the beautiful colors. Physical Activity: Are Your Kids Getting Enough?